If I though Irwins hurt finger 2 weeks ago was bad I was wrong. This Saturday he woke up nibbled some breakfast and then started running round straining to poop. He does this sometimes so I wasn’t too worried and left him to it. A couple of hours later I came back to check on him and he was still straining. That’s NOT normal. So I immediately put him in a warm soak. He carried on straining for another hour as I kept him topped up with warm water. I picked him up to check his cloaca for a blockage or something. And there was a blockage, a hard white blockage bigger than his head. I applied a little olive oil and set him on a clean towel in his enclosure while I called the emergency reptile vet who is an hour’s drive away. Whilst I was on the phone Irwin started running around erratically very distressed. The vet came on the phone with me just as Irwin passed a stone the size of a 10p. He had torn his cloaca with the effort and so I rushed him to the emergency vet. The vet examined him and the stone and said it looks like a ball of hard urates or a kidney or bladder stone. He’s always super hydrated and loves a drink so it’s unlikely to be urates. Plus his diet his perfect and varied, so it could likely be a result of the existing damage to his organs (from his previous owners before I adopted him) and perhaps that near kidney failure means he will be prone to stones. The vet gave him a stitch to his torn cloaca and gave an injection of anti-inflammatory and an injection of antibiotics. He has to go back again tomorrow (tuesday) for the second antibiotic injection and an x-ray. If this is the only stone I can take him home. If there is more stones in him then there is an option of surgery which would be very expensive and very risky considering how small Irwin is. Or there’s the final option. Which I can’t think about right now. He’s my best friend. I just want him to be okay. I will sell everything I own to pay for his surgery just to make him okay. Tomorrow’s appointment feels like doomsday. Scan was inconclusive, but that means there are no urate masses (as those would be visable on xray). The stone he passed is going to the lab and I need to get a sterile urine sample from him for urine analysis. That as well as blood work will check for tumours, renal diseases and infections. Our heart is breaking for our friend Irwin and his human. If you follow Irwins adventures here you know he found his human after living in a home that did not provide him the care he needed to grow healthy and strong. After finding his forever home his health improved incredibly and he became the happy tort we’ve watched grow handsome and strong. Its frustrating to see that even the best care cannot reverse the lasting impact of poor care on a growing tort. The issues are long-lasting. Also, a difficult reminder that our shell friends hide their symptoms so very well even when they are struggling with something like this. We are crossing all our fingers toes and tails and sending the strength of the #turtpocalypse your way Irwin! You’ve gotta pull through this and get back to all noming, climbing, and stomping around. Your human needs a lot more snuggling too. So hang in there. Please send all the good thoughts to Irwin and his human!! And please remember to always spread the word about how important proper care is. For Irwin and for all our shell friends. They deserve the very best. It’s our 2 year Irwinversary today. Irwin doesn’t have a birthday and I don’t know his hatchday… but it was the 1st of Jan two years ago that I adopted him. He’s about roughly 4-5 years old now I reckon but when I got him he was about 3 months away from dying. He had Severe MBD and multiple leg bone fractures. He was as soft as a squeaky toy and his shell would flex as he struggled to breathe. He couldnt walk properly or lift his shell off the ground, and for the first 6 weeks I had him he dragged his back legs behind him while he kinda swam with his front legs. I used to have to sink his food bowl right into the substrate so it was level because he couldn’t climb over the ‘lip’ to reach his food. I spent 8 months syringe feeding him liquid calcium before he stopped being at risk of just dropping dead. I had to learn a lot about reptiles and fast. But my God, what a rewarding two years it’s been. Who could have known how important this little creme brulee booger would become to me??. He is fascinating,determined, weird, adorable and funny!. (And now that tortoise puberty has hit he is also a bit gross at times). The trust he shows me blows my mind and my endlessly thankful he came into my life. Reptiles are hard work, don’t ever be fooled into thinking they’re an easy pet just because they’re quiet. They need specialist lighting and supliments, specific heating and humidity. I have found myself growing weeds in windowsill pots and worrying about the dangers of pesticides or pollution. Searching tirelessly for the first and last Dandelions of the season. I have had full blown panic attacks over poops…or lack thereof. Sometimes even now if he is sound asleep, basking with his little neck lolling to the side a sudden fear grips me and I have to gently blow on him to see him twitch so I know he’s alive. And Christ…I haven’t even attempted hibernation yet. We are so happy you and Irwin found each other and so thankful to you for sharing him and your journey with all of us!! Happiest Irwinversary! Honestly, If I had to pick a post that best captured the reality of caring for a tort, it’s this one. The worry, the struggle, the FEAR that always lingers, the learning, the awe, the joy… it’s every single one of these emotions in a shell made of gratitude and love. It’s not easy. if you think it is you better stick to pictures on the internet. Nope, not easy but man is it rewarding. @tort-time here’s a before and after picture! Oh, Irwin you found yourself an incredible forever home and a human that would do whatever it takes to make sure you’re happy and healthy. Take a look at this shell friends. Having a tortoise is a real commitment. You’ll be rewarded in spades for it but you have to be ready to provide the absolute right care for you shell friend or the outcome can be tragic. It’s true. I don’t know anything about this shop. There are a few (very few) legit places but in general, they poorly kept, illegally captured and provide people with incredibly poor information on care. Pet shops are not good places. Consider adopting from a rescue or finding a reputable breeder. ALWAYS research ahead of time. Zoya has one question for you: Are YOU ready to soft rock?? I’m so happy you found a forever home with humans willing ti give you the care you need to grow happy and healthy! It’s incredible what a difference proper husbandry makes. Heres to another 10 years! Piggy is a 10 yo sulcata. She was rescued by my family as a hatchling with shell rot, soft shell, and a severe respiratory infection from extremely poor care and neglect in what was essentially a puppy mill for tortoises. Her underbite was likely caused by these poor conditions and she occasionally needs to be taken to get it filed down, not a fun task with a 60lb monster. 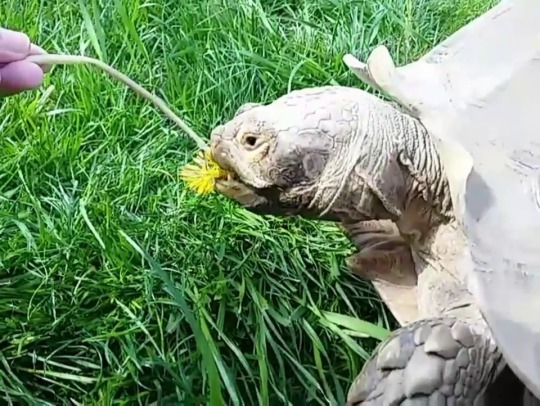 She was originally rescued along with one more sulcata tortoise who died from her illnesses shortly after despite the expensive veterinary care and medication. Sulcata tortoises are unfortunately frequent victims of impulse buys from people who simply think they’re cool and don’t bother to learn proper care for the species. These are the third largest species of tortoise, getting up to around 150lbs. By the time the tortoise reaches 30lbs it’ll need at least a 10x10ft area it can roam, and by the time it’s 60lbs it’ll need a whole yard to roam and a large heated and sheltered shed. They are very expensive to provide proper heating, lighting, and housing for. These are not a species for just anyone and I personally don’t think they should be kept as pets at all by anyone. 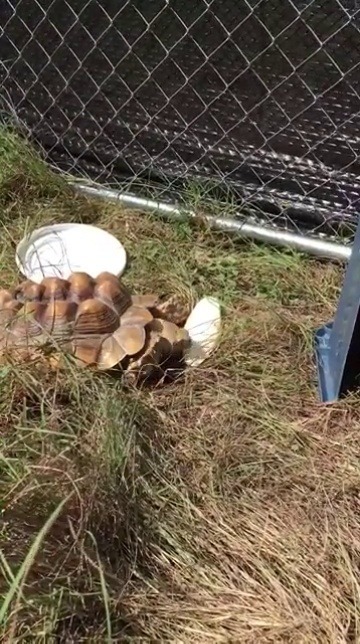 They can be quite aggressive and are strong enough that even a 60lb tortoise like piggy can walk straight through the average chain link fence like a piece of tissue… this is a tortoise that is only 10 years old. They are thought to have the potential to live well over 100 and they are constantly growing. A sulcata WILL get large and you NEED to have a plan should you die or be otherwise unable to care for the tortoise. If you don’t have someone reliable that is able will gladly care for your tortoise for the rest of their lives, should something happen to you, don’t get one, no matter how capable YOU alone might be. If properly cared for the tortoise WILL outlive you and you WILL need a plan for it. VERY important response by a committed sulcata owner! This post is not pretty but it is SO important. you MUST do research before adopting a turtle or tortoise. Know their housing needs, temperature needs, and proper diet. The majority of ‘care sheets’ handed out at pet stores are completely inaccurate. Those “starter kits” that pet stores sell? They are death sentences for your shell friends. They grow, they grow A LOT. Know how big your shell will grow, make sure you can accommodate their needs for many MANY years and at their biggest potential size. They might be fine for a month or two, but not for long and the outcome is sick, dead and/or disposed of turtles and torts. A little research, talking with experienced keepers, and you can find the right info for your shell and create a home that works for them and for you, probably for less money than those kits cost and a happy, healthy shell friend is the gift you’ll get every day for a very very long time. If you aren’t willing to do that? You shouldn’t own a turtle or tortoise. End of story. So this is Zuri. She’s a four year old sulcata tortoise that my sister adopted from a rescue. Her previous owners fed her an improper diet and kept her in a terrarium that was so small that she could not turn around. She’s been in rehab for the last couple of months because she doesn’t use her back legs properly. She’s doing much better than she was, but we still have to correct her when she walks and parts of her shell are still soft from her nutritional problems. My sister is extremely patient with her and she’s a really sweet tortoise. I wish that people wouldn’t neglect animals like this though. Because of the things that happened early in her life she’ll never be a completely normal tortoise and will possibly need special care for the rest of her life to address some internal problems. This is what improper care can do to a tortoise. Please take a look,. Zuri will need special care for the rest of her life. She’s lucky to have found humans committed to caring for her. Too many aren’t that lucky. Only carry animals as far as absolutely necessary to get them out of the road and over the curb or other obstacles, and carry them in the direction they were heading when you spotted them. They know where they want to go, so if you turn them around they will likely go right back into the road. Do NOT relocate them. While you might think that pond 10 miles away would be turtle heaven, relocation is extremely stressful and puts them in danger as they will have to rediscover food sources and shelter and compete with existing animals. Females are especially vulnerable as they are already taxed by egg-laying. If you find an injured turtle or genuinely believe the animal would be in danger if you left it where it was, contact a local wildlife rescue or licensed rehabilitator and ask for their advice. Though it may be tempting, don’t handle or linger around the animal more than necessary. Finally, remember to wash your hands, because salmonella is no fun! IMPORTANT!! Please read This wonderful post. While our goal is to help turtles and tortoises, it’s important we do it in the right way! Our best intentions can cause harm for the shell! NEVER relocate a turtle or tortoise. Only take them as far as needed to get them out of immediate danger. Remember! Saving one turtle or tortoise can mean saving the life of a decade of hatchlings to come!